Rights Group Says Prominent Activist Beaten By Govt. Forces In Bahrain : The Two-Way Nabeel Rajab said the beating "was [the] minimum cost for freedom and justice." Rajab was detained by security forces for participating in an anti-government protest. 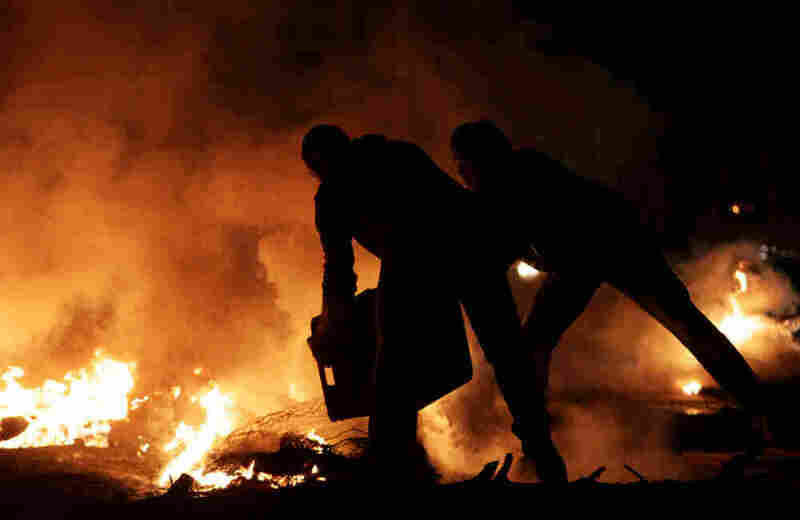 Two men try to extinguish a tire fire Thursday in Sitra, Bahrain, near the site of an opposition rally.Nightly clashes between riot police and protesters continued Thursday night nationwide. The struggle between government forces and protesters continues in the Gulf nation of Bahrain. Today, it came back into focus when Nabeel Rajab, a prominent human rights activist, was detained and beaten by government security forces. "He has told his lawyer on a phone call following the attack that the policemen gathered around him suddenly and started to beat him. He informed the lawyer that while lying on the ground he was beaten all over his body and specially on his back and face and that his face injuries are serious." Rajab was released and shortly after he tweeted, "It was minimum cost for freedom and justice." NPR's Andy Carvin, who's been tracking the Arab Spring on Twitter, reported that Rajab was also defiant. "Next week you're invited to march - same time, same place," he said. "Assembly is not a grant, but a right that can't be waived." "Bahrain's Interior Ministry immediately denied those accounts, saying on its Twitter feed that police found Rajab, head of the Bahrain Centre for Human Rights, "lying on the ground" and took him to hospital for treatment. "It earlier warned the protest march, organised by the Sunni-led kingdom's largest opposition grouping, was illegal and said 'legal procedures will be taken against violators'." In November, the country released a report commissioned by the monarchy that found government forces had used torture to deal with protesters. In a televised speech, King Hamad Al Khalifa said those who committed abuses would be held accountable. But the crackdown on protesters has since continued.